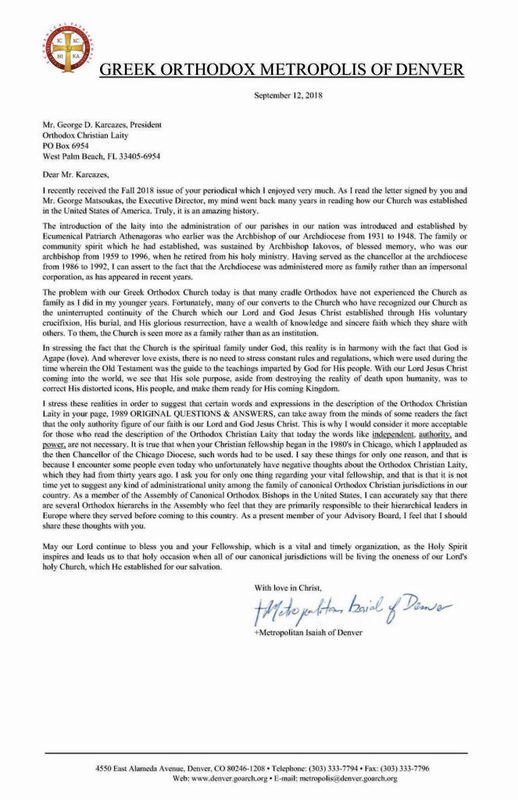 I would like to share this pastoral letter sent to Orthodox Christian Laity by His Eminence Metropolitan Isaiah of Denver as OCL gathers in Cleveland October 17-20 for its 31 Annual Meeting. His letter provides the opportunity to thank all the dedicated supporters past and present who served and continue to serve on the board and advisory board of OCL. Board members serve at their own expense and contribute $1,000 yearly to support the organization. Without their prayers, time, talent and resources, we could not continue our ministry. We are especially grateful to the hierarchs and clergy who have been and who presently serve as advisory board members. Father Steven Vlahos has been a member of the advisory board for 31 years. We are blessed to continuously receive his insight and advice. We are grateful to Father Michael Massouh and Father Dr. Timothy Cremeens. We remember Father Eusebius Stephanou of blessed memory who also was an original advisory board member and hosted OCL at the Renewal Center in Destin, Florida. 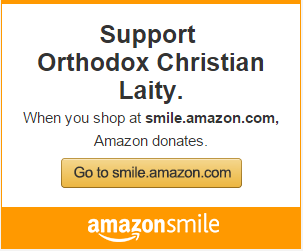 He is the father of the spiritual renewal movement within Orthodoxy worldwide. May his memory be eternal. We also remember advisory board members of blessed memory, Father Thomas Hopko, Father Peter Gillquist and Father Gordon Walker. Each one of them guided our proceedings with love and broadened our understanding of the Orthodox Christian faith. Memory Eternal. We thank his Eminence Metropolitan Isaiah who was assigned to be our spiritual advisor when OCL was started and has observed and guided our movement for thirty years. 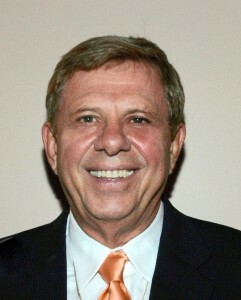 He is presently a member of the advisory board. We appreciate his wisdom and prayers. We also are grateful and appreciate the guidance and prayers of Archbishop Michael of New York and New Jersey and His Eminence Archbishop Benjamin of San Francisco and the West. We are most grateful to His Eminence Archbishop Nathaniel of Detroit and the Romanian Episcopate. He has been a member of the advisory board for 20 years, and in all this time, has missed only 3 meetings. He keeps reminding us that Christ is love and light, and that we must work prayerfully and lovingly. His wisdom and direction inspires the organization. Our prayer is that God grant all of our supporters many years! Click here or on the letter below to view the PDF version. Blessed Advent your Eminence and thank you for your service to our country and our church. 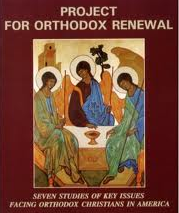 I read your letter regarding Orthodox unity in this month’s OCL pamphlet. I agreed when you said all Orthodox are united in the love of Christ, so administrative unity is less important (paraphrased). Fortunately or unfortunately, we live in a world where business has to be conducted and the business of unifying the Orthodox Jurisdictions falls mainly to the Bishops/Metropolitans in America. I would say those Bishops/Metropolitans who have loyalty elsewhere in the world, should go back to that part of the world, or come to the realization that they live in what could potentially be the most Orthodox country on earth and work towards its unification and growth. Honestly your Eminence, I’m sure there are very few among the Orthodox Hierarchy in the United States, who would prefer administrative unity. I can understand why with the many compromises that would have to be made. The differences in financial assets between jurisdictions, the process as to how Bishops would be appointed to various cities throughout the country, jurisdictional pay scale differences for clergy that would have to be worked out. A whole host of issues and problems to resolve. That is however the directive that was given to you and your brother Bishops/Metropolitans to accomplish from Patriarch Bartholomew. I believe what is paramount in the decision making process for many American Bishops/Metropolitans, is this loyalty to their respective Patriarchs and ethnic clans. Our Bishops/Metropolitans do not see themselves as American Orthodox first and foremost. That is precisely why an American Orthodox Church must be established. Loyalty to an American Orthodox Church would then be the only option available for the hierarch to continue in his Bishopric. That would end any mixed alliance issues going forward. I would also speculate, that the foreign Patriarchates are more concerned with getting a piece of the American pie and less interested in forfeiting their franchised operations in the United States. It’s up to you your Eminence, along with your fellow Bishops/Metropolitans, to unite administratively, so Orthodoxy can be evangelized with one voice to the American people. The people with whom our full attention should be given. I wish you God’s speed.